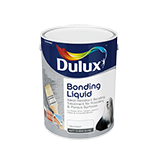 Dulux Primer Sealer (Bonding Liquid) is a sealer for penetrating and bonding powdery surfaces. Approx 12 m² per litre per coat . Contains high quality resin. The best possible penetration and bonding of powdery surfaces - ensures surfaces are properly prepared for subsequent topcoats - thus prolonging life span of the total paint system. For interior and exterior use. One product convenience.